As awful as it sounds, we are fortunate to only be down 15. Nice way to close it out! I'm really hoping to make it to the quarterfinal tomorrow morning. The meltdowns are getting more and more epic each game. It is worth noting that some teams are just a matchup nightmare for us. I'm not confident about us beating anyone at this point, but I do think that we match up better with Marshall than FAU, even though Marshall is probably the better team of the two. It doesn't feel like we're capable of winning any more games, at least not in the regular season. After the FAU game, which we had to mostly play without Woolridge, I mentioned that there is not a team in CUSA that we can beat without him. Sadly, I still believe that to be true even after getting Duffy back and cobbling together a bit of depth via J. Simmons and Alcindor. If Woolridge comes back close to 100% and everyone else also is back, then I would still give us a fighting chance against anyone in the conference. I know it's beginning to sound like a cliche, but there is simply so much parity in CUSA this season to the point where I think most of our conference mates would struggle if they lost a star player for an extended time. And sure, as others have pointed out, our lack of depth has been exposed. But, I would argue that it's really our depth at particular spots where it is truly problematic. For instance, we simply do not have any serviceable replacement for either Z. Simmons or Woolridge. I think we would lose any CUSA game (home or away) that we were to play without either. When we have had to play without players like Smart and Duffy, on the other hand, that has been a problem, but it hasn't completely derailed the offense. I guess by whatever 4-way tiebreaker CUSA uses Louisiana Tech is not the 7 seed? The way this shapes up is really unfortunate for North Texas because we aren't really getting any benefit by being the top seed in the pod. The other 4 teams are all 7-7 in CUSA play and have winning records overall. They are all beatable when they have to go on the road and really tough when they are at home. The only one that really stands out is Louisiana Tech, which is virtually unbeatable at home. And--we have to play them on the road. That is literally the only variable to the 2nd tier pod that could make one team's home/away schedule any more challenging than the next, and we got the short end of the stick by little more than random luck. Starting at the top of pod 2 is already an unenviable position to be in. You are sitting at a spot that has been designated as the highest you are allowed to go, but you also have a lot to lose. We definitely do not want to finish lower than 7, and actually holding on to the 6 seed is critical. Effectively, there won't be much difference between the 5 and 6 seeds in the tournament, and had we limped into the bottom end of pod 1, there's a very serious chance we would have finished 5th. So, perhaps in our case the pod placement isn't going to make that much difference in the end (if we go at least 3-1). Still, as a fan, it is a little frustrating that we cannot improve our seeding no matter how much success we have over the next 4 games. The roster that we had to roll out there today (due to injuries) will not win a single game against anyone in CUSA. Let's hope this was the last game without Woolridge and Duffy. I'm not sure we are capable of beating any D1 team without Woolridge. The one I am the most confused about is Larry Wise. The guy had an impressive offer list, and McCasland really seemed excited about him not only as the crown jewel of the recruiting class but as a player we would all be thrilled with this season. This is a point that McCasland repeatedly made across various conversations in the off-season. Then Wise quickly got announced as a likely redshirt--something that isn't all that common in college basketball these days (outside of walk-ons)--after some vague talk of an injury that maybe kept him out a couple weeks. It does not appear now that his redshirting has anything directly to do with that injury. It's frustrating, though, because this is a 6'5, 3-guard type of player with a lot of scoring potential--in other words, someone we desperately need right about now. I just wonder what he would be capable of at this point in the season if he had been developing all year long. I'm not second-guessing McCasland. He's established enough credibility for me to blindly trust him here and there. I'm sure he has his reasons for not playing him, but I wonder what those reasons really are. It's really hard to imagine beating FIU on the road right now--or anyone else with a pulse, for that matter. Looks like we're destined for the middle tier of the conference. Unless we quickly get healthy and/or some of our players can up their shooting percentage from abysmal to just normal bad, we may limp into the CUSA tournament with quite a losing streak. This really makes the 5 spot look desirable. One could make a case that if you aren't going to snag the top slot, then 5 is the next best option. Exactly. I know a lot of people might have looked at Charlotte's record and assumed we would blow them out, but they have mostly been tough at home in CUSA games. Regarding next week's games, a split followed by another split against the F_Us on the road would probably sneak us into pod play at the bottom end of the top group. But, if we have any designs of finishing in the first or second spot, then I think we have to sweep the Marshall/WKU home games. That won't be easy, but I'm not sure the Florida road games will be any easier. The offense may be phenomenal, as in averaging 40+ points a game. 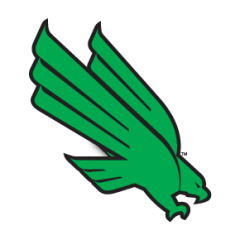 It may end up being one of if not the best in North Texas history. And, we could still end up winning fewer games than in 2018. I fear that some of us are really underestimating how the defensive losses will factor into all this--not to mention the coaching shakeups.